That place is what sprang to mind when it was announced we’d be baking the late, great Marion Cunningham’s popovers this week. There’s something fun and kind of magical about popovers–how does such a runny, crepe-like batter explode and mushroom like that in the oven? And because they are hollow inside, eating them is kind of like eating air. They do take a while to crisp and dry out, and there’s no peeking in the oven (unless you have a working oven light), so if you are an impatient type, these may test you a bit. But that’s the only hard part….the batter is sooo easy to make…a 15 second blender blitz and it’s done. I happen to have a popover tin that was gifted to me, but you certainly don’t need one. A muffin tin works, and Marion even used custard cups in the BWJ episode. We had ours for breakfast…some with honey, some with jam. I heard a savory twist with cheese and herbs is tasty, too. For the recipe, see Baking with Julia by Dorie Greenspan or read Paula’s Vintage Kitchen Notes and Amy’s Bake With Amy. A short version is also here. Don’t forget to check out the rest of the TWD Blogroll! Wow, you are the first member of the group with THE original popover pan…. (sorry to admit that, but I am jealous!!! I’ve been looking online but apparently it’s impossible to get them in my country). Well, your popovers looks fabulous! Those are some lovely looking popovers. Are those popover tins? Interesting to know that there are popover restaurants. Hmmm….I love the idea of filling these with chicken salad. I wish I had thought of it over the weekend. I do covet you pan,,,,It just might be my next purchase. These were a bit of magic. Can’t wait to make them for my grandkids–monster muffins! Love the photo and the font – how appropriate! 🙂 Beautiful job! such picture perfect popovers! i am jealous-i don’t have a popover pan! i used a heavy gauge muffin pan and it worked well. i liked them just plain and crispy and ate them with a big green salad. Beautiful popovers! And I love the idea of serving popovers at restaurants, I think Tyler Florence does at one of his restaurants here on the west coast too. I’d love to try a huge one with a salad inside! That sounds like it was a great place for University kids to hang out – too bad it didn’t last. We loved these and my nieces are looking forward to trying them again, perhaps with some of the sweet or savoury variations we’ve seen on other folks’ posts. 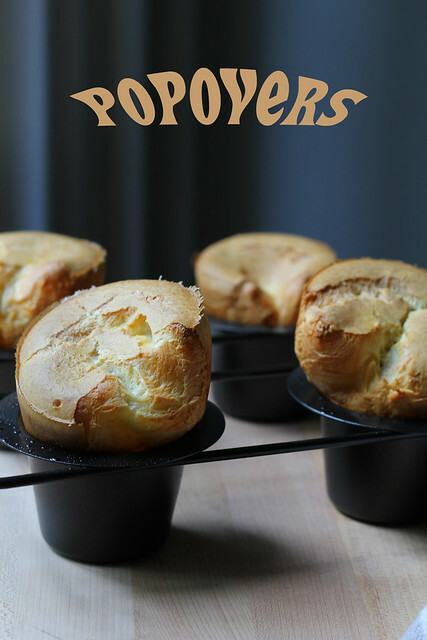 I love your photo and the type is just perfect for popovers! You popovers look absolutely gorgeous! I’ve never had these or even heard of these before. They were a bit confusing to me, but I’ve loved reading how much they are a part of people’s lives and upbringing! I’d love to try them at that restaurant! Totes jeal of your popover pan! Yours came out so lovely. Indeed there used to be a brunch place on the UWS by Barney Greengrass on Amsterdam Ave and 86th called Popover, but I don’t know if it’s there anymore. They, too, had giant bowl sized popovers in a variety of flavors – but theirs seemed to be more inspired by crepe/omelet filings. And when you first arrived they served you a basket of mini/normal sized popovers with a crock of strawberry butter. So freakin’ good. I hope to make a run back up to the UWS in a few weeks and see if it’s still there. Love your photo…you made some beautiful popovers! I have already been checking out Amazon for a popover pan…I just have to have one now! Salad in a popover sounds interesting. Good to hear about other ways to enjoy them! Yours look lovely! These were fun to make. And fun to fill with jam, or syrup, or butter. Love those still in the pan. Perfect, perfect,perfect. Love the popover pan! Your popovers sure look happy in that pan! I enjoyed your post,I used to make popovers for breakfast many moons ago when I was a stay at home mom. We had some filled with a scrambled egg, meat & cheese combo, as well as buttered with jam or honey. I think this is a perfect Sunday brunch idea…Now I can’t wait for the weekend!